Top things to do in Southern California. The first thing we did when we got to our House sit was seek out a July fourth parade. "But we're BRITISH!" wailed the eldest. "Why oh WHY can't we just stay home?! They're all celebrating the fact that the British have left them alone- so why are WE going?!" I was pleased they knew what was going on, but dragged everyone along in the name of 'cultural immersion' anyway. We are in the States. We are getting involved and we might meet some interesting people. The first person we got chatting to was wearing Union Flag socks- I liked this touch and quickly started to talk to his wife about childbirth. I had clearly been missing female conversation without even realising it. There was a whole street filled with doughnuts, fruit, coffee and cakes- all decorated with red, white and blue. Cups full of flags to wave and patriotic music blaring from a speaker tied to a pull-along cart as we walked around the streets. We marched, we chatted, we told absolutely everyone that we are British. Everyone asked what we thought about Brexit and apologised for Trump. Since the referendum, we seem to have found allies in the Americans we meet- we're mutually embarassed about our current political landscape. We all wish the world was more tolerant- in California at least. Learning to skate at Venice beach. 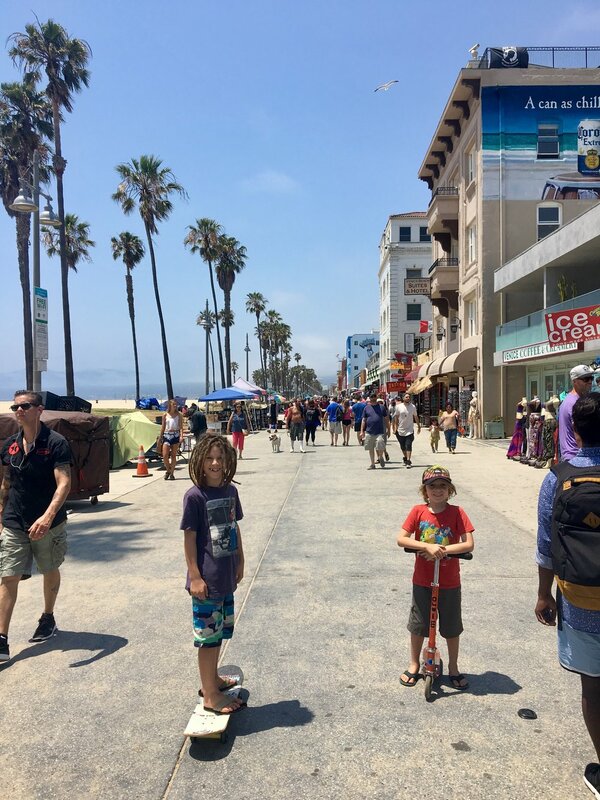 The beach and pier are classically Californian, great for chilling out, swimming and fishing. Check our Muscle beach where Arnold Schwarzenegger used to train. Watch the world-class skaters pull off some sick tricks. The real highlight here though is the boardwalk. Skateboard, cycle, hula hoop, whatever you fancy doing towards Santa Monica pier- there are performers and eccentrics everywhere, and most of them like a nice chat. In fact, anyone is allowed to trade along the boardwalk as long as they are selling 'unique art'. In real terms, many of the traders are homeless people trying to make a living. Their wares are outrageous and creative, their stories are mind boggling and human. Stop and have a chat, you won't be sorry. Just a two hour drive from Los Angeles, the boys announced that this place was EVEN BETTER than Grand Canyon AND Yosemite. The Mojave desert was filled with trees that early Mormons thought looked like Joshua raising his hands to heaven like in the biblical story. The name 'Joshua Tree' stuck- and I guess it's more catchy than 'Yucca tree' National Park. We arrived on a day that was BAKING HOT and we made our way into the National Park to find the Wild West that I knew from Saturday afternoon cowboy films that my Dad used to make me watch. The 'Hidden Valley showed us the place where rustlers hid their stolen cattle and we could imagine just how lawless this place was and how tough you had to be to survive here. Malibu Beach. We didn't spot any celebs but enjoyed digging holes and paddling. The waves were huge and there were no facilities, so we didn't last that long. Nice to know that Jay-Z and Beyonce could have joined us at any moment, though. The children's 'discovery zone' was a nice easy walk, but the best bit was 'Skull Rock'. To be more precise, the best bit was climbing over the scorching hot boulders- we took lots of water and needed it all- so be warned. Totally worth it for the experience of scaling height to survey the mind blowing, ethereal landscape, the Joshua trees and the plethora of wildlife that somehow exists in this heat bowl. The Endeavor, Los Angeles Science Centre. We got to see the space shuttle 'Endeavour' and learn about space and flight, We also looked at different eco systems and made slime out of Borax. Having sampled science museums from all over the world, this was a good one. Not quite 'Sci-tech' in Perth, but still good. Is taking your children to Skid Row a good idea? Well, we weighed it up. Mike and I have a history of working with homelessness and we are pretty determined to make sure that part of our travelling experience involves being useful and indulging this passion/ vocation/whatever. After noticing the huge homelessness problem, we started with making up aid bags to hand out to homeless people we met in LA. We did some internet research and found an organisation called 'Lunch on Me' who we ended up helping- plating up food to hand out to the people living in tents on the streets of the richest city in the world. I have a whole load of stuff to say about volunteering- there is another blog post to come on this. Suffice to say that I find getting out of our comfort zone useful. We met real people, we bonded; but most of all we were shocked at how much like a refugee camp Skid Row was. The place is like a museum of the future, with incredible sculptured gardens and space-age buildings. It is also FREE to enter. The staff are quick to reprimand anyone who does not observe the CHANGE IN FLOORING which indicates where you must not step. Hard for children to remember- personally I would have preferred an old fashioned rope set-up, but there we are. The children's audio guide was really useful for a while. In reality though, I repeated history by dragging my children around to look at Rembrandt and Da Vinci when their interest waned after about twenty minutes. To help with this, there is a family play area which was air conditioned and fun. The best bit though? For our children it was the electric tram that takes you up the hill to the museum. Super efficient and lots of fun. Huntington Beach- famous for its surfing. The fishing on the pier looked pretty good too. Children's play park and splash park on the water front. They happened t be handing out free lunches to all children here too. A free rental upgrade got us a convertible Beetle for our San Diego road trip. Look how happy we are. We stayed with (new!) friends in Encinitas who showed us a great children's splash park on the sea front. After we cooled off we satisfied Mike's love of military hardware and boarded the USS Midway which was just ten minutes walk away. The aircraft carrier was interesting- the boys loved sitting in the cockpits and Mike had a very special moment when he spotted the F14 Tom Cat from Top Gun. I found people watching the most interesting- SO MANY PEOPLE were going crazy for the planes. I sort of get it, but what interested me most was the below deck tour. You got to see how people lived at sea- the mess halls, the post office, the logistics of everyday life which were played out with waxworks. A bit cheesy? maybe, but it brought it to life. San Diego is famous for its beaches- this one had us jumping around in the waves at sunset and toasting marshmallows in communal fire pits. Sounds perfect, doesn't it? People were playing guitars, we had sandy toes and salty hair stuck to our faces. I felt like I did when I first went to festival and realised what all the fuss was about. We were living the SoCal dream and we got it: it really was quite lovely. We walked down the slope by the shell shop and watched as the Sealions splashed, played and fought in the sea. I WISH we had brought our snorkel kit. There was a kelp forest a few metres from the rocks and so there were SO MANY colourful fish in the sea, swimming around the underwater caves. Another option is to kayak, but you must hire these from La Jolla cove- quite a way away from where we ended up. If I was more organised I would have loved to hire these, so be up close to the sea lions as they played on the caves. I was happy to hang out on the rocks though, shrieking as the sealions appeared from nowhere and as the children played precariously on the rocks. A sleepy town full of boutique and vintage shops. Lots of great cafes for milkshakes and huge plates of brunch. Our new friends in San Diego who hosted us. Not everyone was happy to have a photo taken can you tell? MY FAVOURITE EVER TV show, 'Six Feet Under' was set in this inconspicuous house in an inconspicuous neighbourhood. 2302 West 25th Street, Los Angeles in case you want to visit. Joshua Tree National Park: £19 for a 7 day permit or £31 for an annual pass which covers all other parks, WISH we had thought of getting this! USS Midway: £40 for a family of 4 if you book online. California Science Center: FREE to enter, but the Endeavor exhibition cost £3 each. All accommodation was taken care of by lovely friends, old and new. Budget Rent a car, Studio City and Hertz. Clink on link for rates. Parking can be a pain in LA and San Diego. Budget for parking meters, and don't stop at the first one you see. We first saw $15 per hour at La Jolla, turned out we ended up paying $4 an hour after driving around for a bit. Newer PostPuerto Vallarta- Mariachis, Margaritas and Molcajete. Older PostSharks, Parks and Route 66. Our great American road trip.